The Mission I features vertical mullions over a veneered panel in the upper door opening and a standard veneered panel in the lower door opening. The top opening is always 6-5/8″ high regardless of the actual door height. Framing width is 2-3/4″. 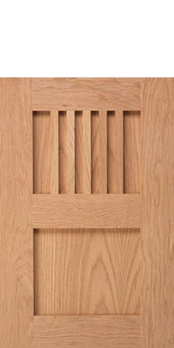 Quarter Sawn Red or White Oak are great wood species selections for this door. This is a great accent door for certain areas of the kitchen or, if used wisely, this model door can be used throughout an entire project. The cross-section shows how your door may look, but the profiles you select will affect the final look of your door. Quarter Sawn Red or White Oak is a great choice for any Arts & Crafts design.